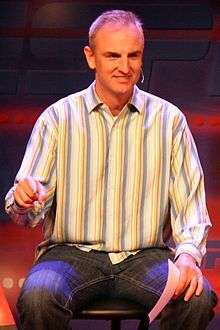 Hal Chapman Wingo III (/ˈwɪŋɡoʊ/; born September 19, 1963), known as Trey Wingo, is a co-host of ESPN's SportsCenter, as well as co-host of NFL Live. He has also served as the host of the Women's NCAA basketball tournament. Wingo is the son of Hal C. Wingo, Jr., founding editor of People magazine. He grew up in Greenwich, CT. He attended Baylor University where he was a member of the Phi Delta Theta fraternity. He graduated from Baylor in 1985 with a bachelor's degree in communications. He is the current host of NFL Primetime along Merril Hoge which airs after Monday Night Football. Wingo was the play-by-play man for the AFL on ESPN with Mark Schlereth. He also hosts ESPN's Who's No. 1?, and one of his favorite quotes is late Arizona Cardinals head coach Dennis Green saying about the Chicago Bears, after they blew an upset chance, "They are who we thought they were!" Wingo lent his voice to the video game ESPN NFL 2K5 and also can be unlocked as a free agent in Season Mode. Wingo also lent his voice and likeness to the video game NFL Head Coach where he can be seen hosting a virtual NFL Live. Wingo is also the play by play voice on the new EA Sports video game, NFL Tour. Most recently, Wingo has appeared in a campaign for luxury Swiss watchmaker Raymond Weil's RWSport collection. He and Bob Ley hosted the lone SportsCenter on September 11, 2001, announcing there would be no games for the week. Wingo is married to Janice Parmelee. He became an official supporter of Ronald McDonald House Charities in 2007 and is a member of their celebrity board, called the Friends of RMHC. He also works closely with the Prostate Cancer Foundation and the Jimmy V Foundation for Cancer Research, as well as Special Olympics and Children's Hospital of Chicago. ↑ "Celebrity Friends of RMHC". McDonald's Corporation.